McCain said Obama's Senate record was more liberal than a self-described socialist's. In an interview after the event, The Kansas City Star asked him to clarify the remark. “His voting record … is more to the left than the announced socialist in the United States Senate, Bernie Sanders of Vermont,” McCain answered, according the paper. Good point, Capitalist. Bill gets, what, $300,000 for each speech? Why aren't you Democrats denouncing that as hideously greedy!!! Or is Bill not a "greed monger" as some of you have said. It's about equity and fairness, people, NOT equality. You work harder, you should get more. You don't work as hard, you don't get as much. Show me ANY socialism based system that includes this and is a world leader. They're not. They instead have relegated themselves to the "relying on the rest of the world for innovation, etc." category. Hopefully you can at least understand why that bothers those of us who actually DO want to innovate, create, produce, etc. rather than sit around and get paid for it. If you need major surgery, where do you go? Not to Cuba (MM give me a break! ), nor Russia, nor Mexico. You come to the U.S. There's a reason for that. Try using your heads and figure out why. Well, that's "Change We Can NOT Believe In" for you! When Senator Obama gets called on the carpet for his socialistic views, watch him flip-flop, as he normally does. Funny, at every turn he has critisized Senator McCain for his temper, yet, he seems to get his "gander" up over the most trivial issues/things. Particularly when people (voters) disagree with him. American voters, is this whom we want for president? We don't need a rock star or someone with rock star status. We need someone who can turn our country around. Is Senator Obama this individual? I personally do not think so. If anything, his politics/views and those of his misguided, bleeding heart supporters have caused our nation to be more divided than ever. Is this what we want for our beloved America? Think!!! And, McCain, are you a neocon? Or you're never going to admit it but I should just look at your voting record? Well we know bush/mcSame/cheney are fascists! I am so sadden by Senator McCain, a man I have respected for decades. I can't believe how far he has fallen from his beliefs and ideals. What is wrong with the people who run the Republican Party if a proud, honorable man like Senator McCain must sell himself out to secure the nomination and the party's "base'? This behavior makes me want to cry. I guess the party has to hit rock bottom before it can rebuild. McCain really has no room to talk and talk about trying ANYTHING. Hey, "You Can't Win"...stop being a whiner and try working hard for a change rather than looking for a handout. What a dirty trick, to make such an accusation right after Obama leaves the country. Too scared to say it to his face? FACT: Obama has the most leftist voting record. Come on people. Don't be retarded. Just cause you worship Obama doesn't mean you should e ignorant too. McCain just said what was true and everyone goes crazy saying "That's low for him to say that!" Since when is stating a political fact low? With all the experience with respect to foreign policy, security concerns, etc. If you combine President Bush, VP Cheny, Rumsfield and Senator McCain it is over 100 years in the the above mention. Did that extend experience the GOP is talking about prove the USA with the fore mention? Senator Obama has a different process to bring back the USA back to it's standard of world leadership and exemplar..
We should not deny our selves of this change towards economic growth and regain our position as the world leader..
Hey, Obamanation, where exactly is the venomous "name calling" that you are so shrilly whining about? Mr. Cain saying that he doesn't know if Obama is a ModCom but he sure votes that way isn't exactly stinging rhetoric......it's just direct observation of the facts. Geez McCain. As far as we know you didn't eat human flesh in 'Nam either. Way to go with the unsubstantiated rumors. If this is all you can campaign with, you're more pathetic than I initially thought. And that's a lot! Way to swiftboat anyone in your way. Slander them all and let God sort them out, right? What kind of idiot is seriously considering voting for this scumbag? Hope you guys realize socialism is a variant of fascism– Hitler was one of the biggest proponents of socialism, along with Stalin, of course. Those two are very much the same. I don't want the governmnent to tell me how to spend my money or live my life! Not to mention, government intervention is the reason for all of our economic woes. If the dollar were maintained strong, and inflation kept in check, oil and other commodities would be at a resonable price. Instead, it's printed like toilet paper to fund this stupid war in Iraq. "Do you like social security – they you like "socialist" programs. 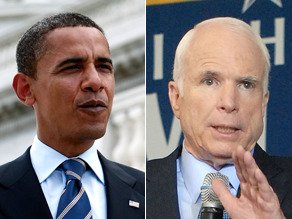 If you mean is Obama that kind of socialist – maybe – but so is McCain. " Why is it that any time someone asks him a hard question or one that he as not prepared for, he has no answer? And by the way, I have no problem with each person being able to achieve to the heights of their goals and abilities. However, it is governments responsibility that each of those people starts from a level playing field. You must be kidding me. First they try to say he is muslim then a terrorost now a socialist. Can't these people just talk about the issues and quit labeling everyone. How about this for a label for McCain: DANGEROUS. He is a corporate socialist, all the benefits go to a few private corporations but the risk is spread out to the taxpayer. Look at all the bank and mortgage company bailouts. This name calling is stupid! A lot of the people who vote republican don't even know what a socialist is......for that matter they aren't even sure what a republican is anymore. They just know they don't want to vote for a African American. I wonder if they even know what a racist is? Opps I forgot we are talking about that brand called the RNC. McCain hit the nail on the head!!! Nobama, "Change" We can all PAY for! We NEED someone from the extreme left to counteract the devastation that the extreme right has brought upon us! "Obama might be a socialist. And a terrorist. Er, um. He's probably a socialist terrorist. He's a scary black man. Boog-ah, boog-ah, boog-ah!!!" John McCain has all the charisma of a glob of cottage cheese. And all the wit and insight of a...well, of a Republican. Yes he is. he may even lean to fascism, too. In Colorado Springs earlier this month he said he wanted a civilian national security force (see Hitler Youth) that would be as big as the military and funded as well. The military is 500,000 strong with a $439 billion budget. Where's he going to get that? And what will this group do? Spy on us? report us if we talk in favor of the Constitution??? Such nonsense. The politics of insult and divisivness are alive and kicking in the McCain camp. I truly believe that the American people have had enough of this type of politics. I know that I have. When will Obama and the Democrats stop taking this crap? THAT is what I have been waiting for most of my adult life. For a Democrat with the stones to stand up and say 'NO MORE'!!! That's why they keep losing elections. If they can't and won't defend themselves, then how can they expect Billy six-pack to believe that they'll defend him? CHANGE??????? BO – null null – otherwise known as Dr. NO! "CHANGE"……What I Believe BO's Definition of Change Is! Once again all these Liberals Morons on this Blog, not knowing the Actual truth about OBAMA see above!!!! Hispanic, Latinos open your eyes OBAMA is NOT for us!! he is for the European, the entire Muslim Nations, and NOT fo the UNITES STATES OF AMERICA. There are Thousands, and Thousands of Hispanic Latinos going for McCain, Don't hate!! John McCain is a True Patriot!! He loves his country!!!! !